Will Hutchins on being a clown, John Ford and "Mr. Ed". I ran away and joined the circus. I headed down under and traveled Australia with the Ashton Family Circus, established in the 1840s. Mighty beautiful land, mighty beautiful people. 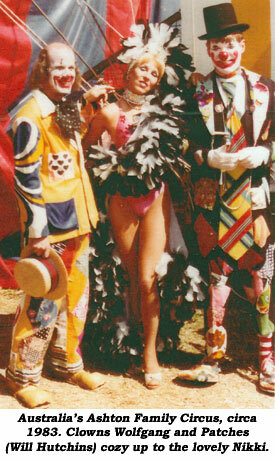 I was Patches the clown, a disruptive force as all good clowns should be. Circus life is terrible hard. You really have to be born into it. After three years I ran out of balloons, my trailer and I broke down, the German lady clown was killed by Abu the elephant. Time for aloha on the steel guitar. After hearty handclasps I tripped the light fantastic to Singapore, Sri Lanka, England, France, Spain—just passin’ through. I ran out of pesetas in Majorca and returned stateside, the world’s oldest unemployed clown. Back in L.A. I was pleased to see everything was under control despite my long absence. First order of business: I formed FASASC, The Friday Afternoon Sip and Sup Club. We ol’ cronies would gather once a week at the Masquers Club in Hollywood. After lunch we’d repair to the basement barroom for beer and bull and to soak up the local lore. The building was haunted, sort of—one of the bar stools was visited on occasion by the ghost of Alan Mowbray they say. I hoped he’d show up. I’d treat him to champagne and he’d recite “To Be of Not To Be,” just the way he did in “My Darling Clementine”. There was a white upright piano down there with the names of hundreds of members carved into it. Legend has it on the day Jack LaRue died his name glowed and quivered. One afternoon we were all crabbing about the smog. Comedy writer Hal Kanter told us to be grateful—the L.A. smog’s so thick the pit bulls can’t find you. Pat Buttram was a regular. He told me his granddad was in the Civil War and invented jogging. ‘Course, in those days it was called desertion. Met an interesting chap at the bar—he’d served in the Navy during WWII with John Ford. After the war, Ford invited this chap to stay at his ranch in the Valley. The place was packed with Ford’s pals. They all had something in common. They were either recovering alcoholics, recently divorced, out of a job, down on their luck, or all of the above. You could stay there as long as you liked. Only one unwritten law: If you beat the old man at chess, you were history. Alan Young was always a joy to talk to. He was born in a wee seaside village in Scotland. How wee was it? One day the tide went out, and it never came back. We talked about “Mr. Ed”. The voice of the horse of course, of course, was Allan ‘Rocky’ Lane. How did they get Mr. Ed to ‘talk’? Trainer Lester Hilton, who broke in with Will Rogers, would lie on the ground out of camera range and tug gently on a light nylon thread concealed under Ed’s upper lip, causing a chewing motion. To get Ed to stop ‘talking,’ Hilton would tap Ed’s leg with a long crop. One day Young and Hilton were riding in Griffith Park, Young atop Mr. Ed, a parade Palomino. Hilton roared with laughter. Whenever Young would stop talking, Mr. Ed would commence his chewing motion. Pavlov’s horse?